Pressure from customers has been helping to persuade supermarkets to provide alternative ways of transporting their goods home. Lidl has announced it will be phasing out plastic bags from all its shops – the first supermarket chain in Denmark to do so. From September this year, the chain will provide FSC-certified paper bags as a means of carrying home goods. Countries such as Italy, France and the US state of California have already forbidden plastic bags in a bid to prevent them from becoming an even greater environmental problem. Lidl is taking up the challenge, partly as a result of customer demand for alternatives to plastic. In Europe as a whole, 100 billion plastic bags per year are used, which equates to every inhabitant using around 200 of them, so there’s lots of room for improvement. As well as offering paper alternatives, Lidl will phase in reusable bags as well as sustainable Fairtrade cotton ones. “We as a supermarket chain have a responsibility for our customers being able to get their goods home easily. We are also proud of being the first chain to phase out plastic bags and use alternatives,” said Tina Kaysen, who is responsible for corporate social responsibility at Lidl. However, Lidl is not alone. The trend is spreading. A health shop in Frederiksalle in Aarhus has been giving customers the chance to buy biodegradable bags and cloths made of maize-based plastic, which don’t contain troublesome micro plastics. 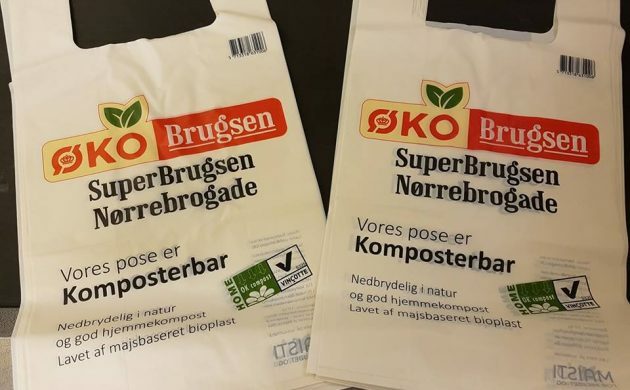 SuperBrugsen in Copenhagen’s Nørrebrogade has followed suit, and on June 1 it introduced the same maize-based biodegradable bags at its checkouts. The bags can take up to 10 kilos of goods and cost 4 kroner.